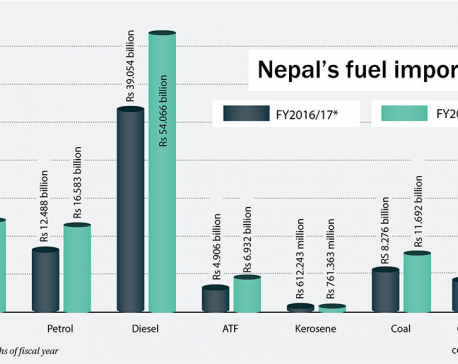 KATHMANDU, May 11: The import of petroleum products has gone up significantly in the first three quarters of the current fiscal year, making it a prime contributor in further exacerbating the yawning trade deficit of the country with India. According to the provisional data released by the Trade and Export Promotion Center (TEPC), the import bill of the petroleum products rose by whopping 34.2 percent, or Rs 29.9 billion, over the nine months of the current fiscal year -- FY2017/18 to Rs 117.29 billion, compared to the same period of the last fiscal year. The petroleum products now alone account for 13.4 percent of the total import of the country. 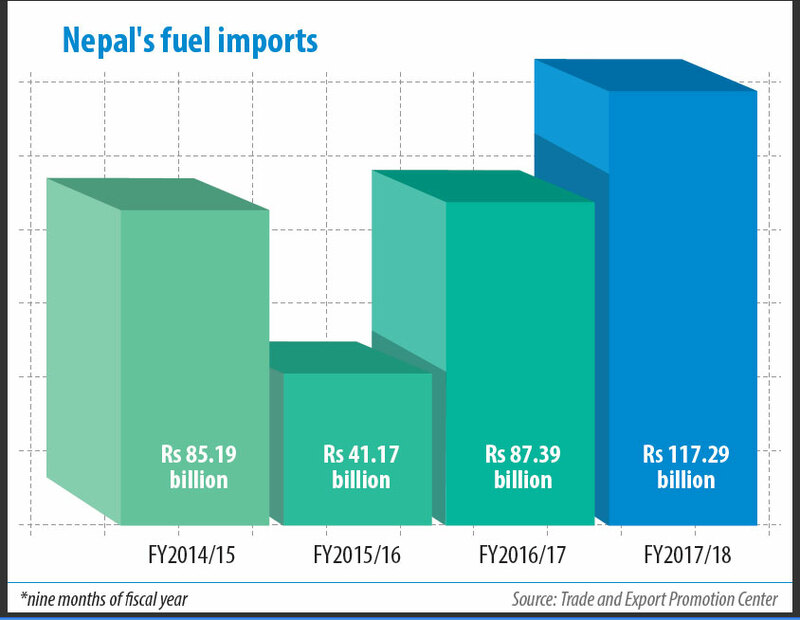 Nepal had imported petroleum products worth Rs 87.39 billion in the same period of the last fiscal year, shows the TEPC data. The whopping rise in the import bill of the petroleum products in the current fiscal year despite the end of the load-shedding is attributed mainly to the increase in the price of the crude oil in the international market. Suyash Khanal, deputy director at the TEPC, said that the rise in the consumption of petroleum products by industries coupled with the recovery of price of crude oil prices in international market has increased the import bill of petroleum products in Nepal. “Many industries are still facing load-shedding for some hours and they rely on petroleum products to power their plants. 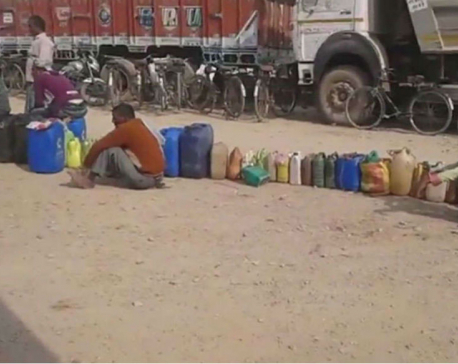 This has sustained the demand of the petroleum products,” said Khanal. “The recovery of the price of petroleum products in the international market has also increased our import bill,” he added. benchmark price for purchases of oil worldwide -- rose above $77 per barrel this month. Meanwhile, the trade deficit of the country continues to widen at an alarming rate. The TEPC data shows that Nepal registered a trade deficit of Rs 815.26 billion in the nine-month period of the current fiscal year, a massive rise of 21.5 percent from the trade imbalance that the country faced in the same period of the last fiscal year -- FY2016/17. The total import rose 20.4 percent to Rs 874.88 billion while the export grew by merely 7.4 percent to Rs 59.62 billion. With the huge mismatch between import and export growth, the export to import ratio is now 1:14.7. Such ratio was 1:13.1 in the corresponding period in the last fiscal year. The export of the woolen carpet has taken a dive of 10 percent to Rs 5.1 billion while products like readymade garments, lentils, cardamom, ginger, tea, medicinal and aromatic plants, leather, footwear, pashmina and carpets have performed well in the review period. 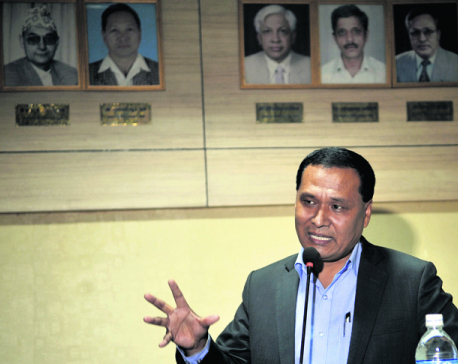 Sarad Bickram Rana, executive director at the TEPC, said that the rise in the export of products listed in Nepal Trade Integration Strategy indicates that the efforts made by the national trade promotion organization have paid off. According to market manager, Laxman Bhattarai, the marketplace has around one bigha of land with six slum dwellers, who if rehabilitated safely, the market place will be a safe place to construct the plant.